The place of Parliamentia is on the border between Bidart and Guethary, its name dates from the time when Guethary took its independence, to be no more considered as a district of the town of Bidart but as a full-fledged commune, Parlementia was therefore the place parliament between the two municipalities where administrative decisions were discussed. 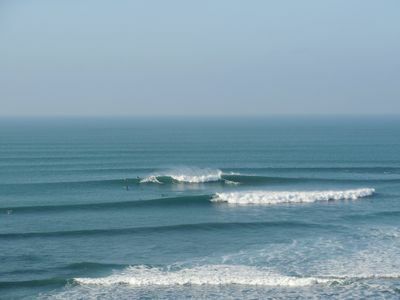 Today it is one of the most famous spots of the coast for its endless right, in all the surf magazines. It is known to be easily accessible thanks to the entrance to the water that can make the difference. It is not more reliable all over the coast, parliamentia is a rocky bottom wave, it never produces because of the swell, the spot 1 to 5 meters, the preference of East / South East. This is a big hit spot, when the beach break saturates the surfers fall back on "Parle" the reliable and friendly spot. A Parliamentia no matter the waves everyone is happy, longboards / weapons can go deep underground and shortboard surfers can find a deeper wave near the edge. If you come with some people who aren’t surfing, no worries, the waves do not reach the edge, they can donut peacefully.